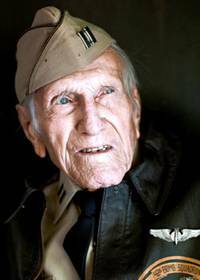 Louis Zamperini, an Olympic athlete and World War II officer, died at the age of 97 last Thursday, July 3. This amazing man did not lead an ordinary life, having run the 5,000 meters at the 1936 Olympics (he missed a medal but ran his last lap in an astonishing 56 seconds) and also surviving untold, horrible conditions during his service in World War II. While on a mission over the Pacific Ocean in search of a fellow, fallen pilot, Zamparini’s plane failed and crashed into the water. Zamperini and two other crew members survived but were left to fend for themselves on a raft for 47 days. After one of his colleagues died while on the raft at sea, Zamperini and the remaining survivor washed ashore and were taken as prisoners of war by the Japanese. They were fed poorly and Zamperini was singled out and abused by one of the camp sergeants. Zamperini was prematurely declared dead by the US military, but as we find out, he endured. His whole story can actually be read in Laura Hillenbrand’s bestselling book, Unbroken, which is also being turned into a film to be released on Christmas Day this year. You can see the trailer for the movie here. His disarming blue eyes twinkle. For a man who has weathered so much and is still here to tell the tale, you’re inclined to lean in when he offers his wisdom. “The secret of longevity is attitude,” he says.